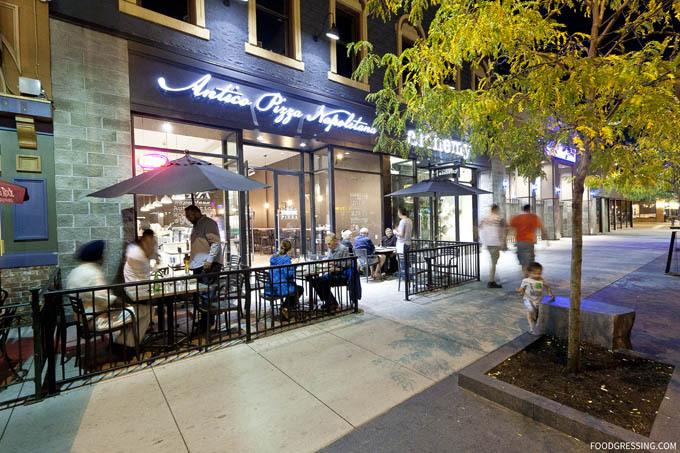 While visiting Downtown Kelowna last month, my family and I stumbled upon Antico Pizza Napoletana. Located at 347 Bernard Avenue, it was just a few blocks from the waterfront. Since Neapolitan-style pizzas can be prepared rather quickly and we were quite hungry at that time, Antico seemed like a good place to grab some fast and hearty eats. 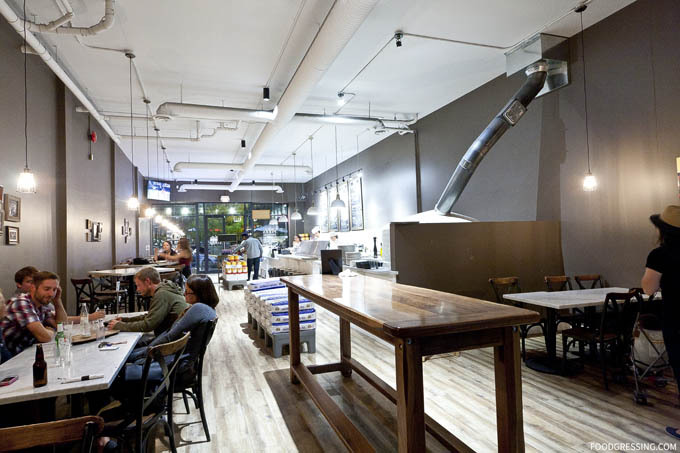 A quick Google search also showed that Antico Pizza opened up just over a year ago and is Kelowna’s first authentic Neapolitan pizzeria. On the menu are ten different pizza flavours priced between $8 – $18. 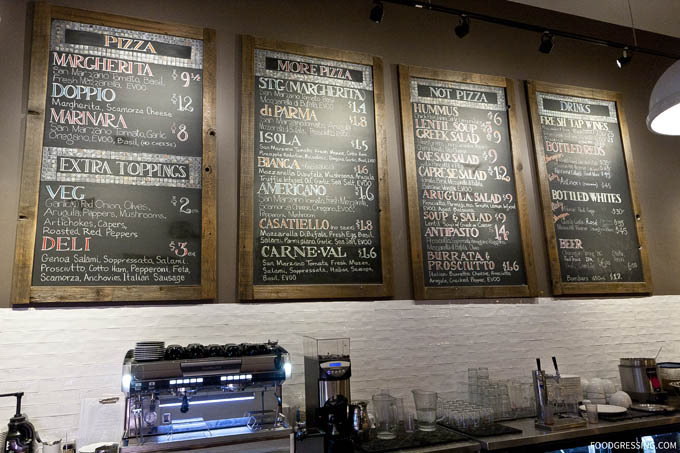 Aside from pizza, they also have hummus, soups, salads, antipasto, and burrata & prosciutto. And of course since it is the Okanagan, local beers and wine are available. How it works is that you place and pay for your order at the counter and the food is then brought to your table. The interior of the restaurant is rather spacious and minimalist. 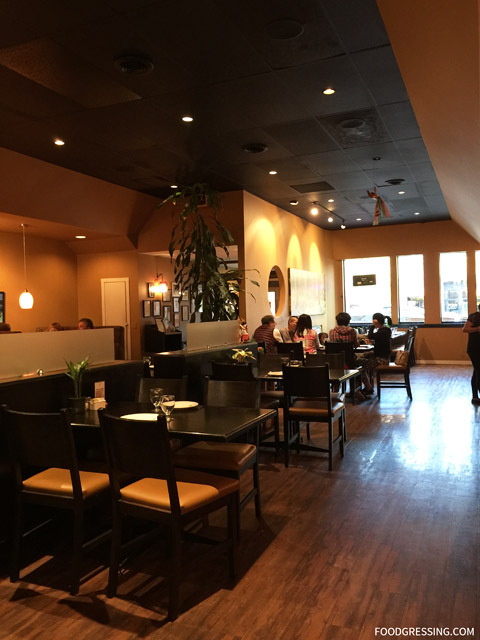 There are high top tables closer to the front of the restaurant and several larger dining tables at the back. The kitchen is open-concept so that customers can watch the pizza making process. 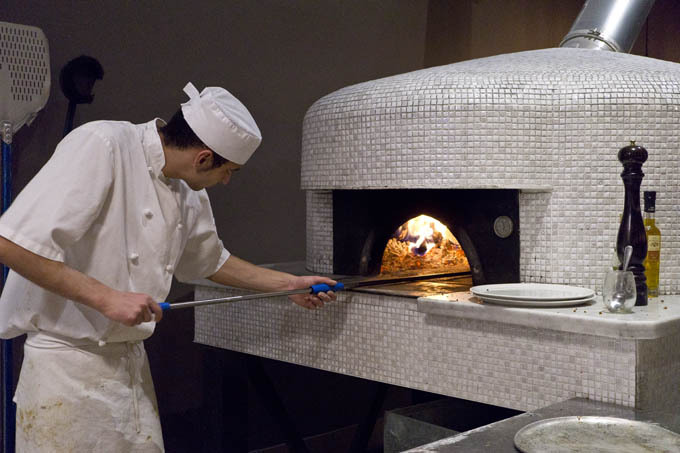 Antico has a traditional pizza oven that was made in Naples, Italy and imported to Kelowna. 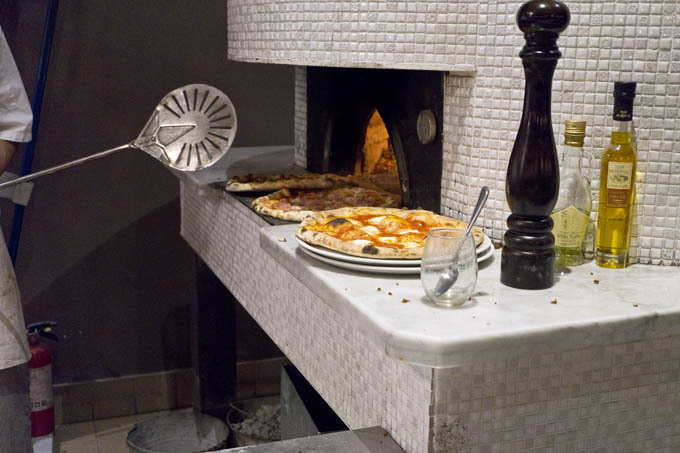 It reaches a temperature of 900 degrees and the pizza is baked in less than 2 minutes. 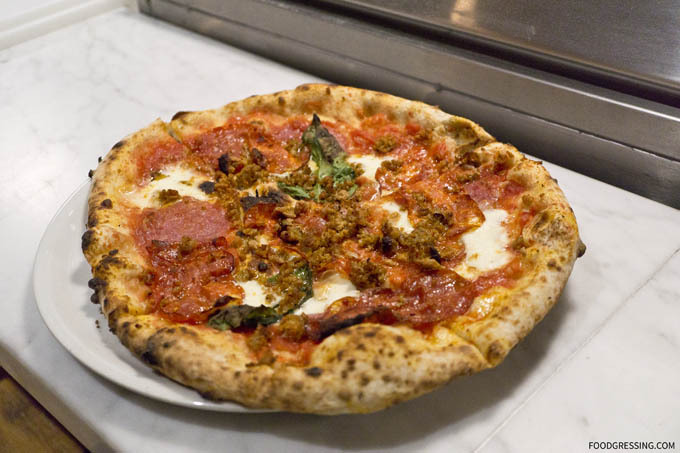 Their Neapolitan-style pizzas stays closely and authentic as possible. Tomatoes, flour and mozza are imported but vegetables are locally-sourced. 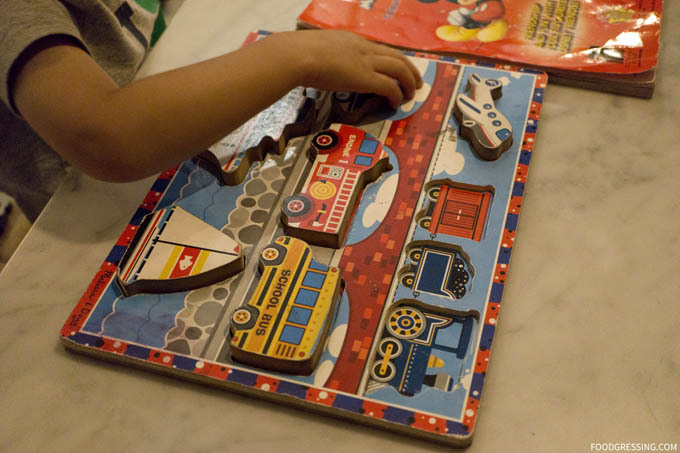 The restaurant is also very kid-friendly with high chairs and a few toy for the kids to play. My family and I had the Carneval ($16) and greek salad ($9). Unfortunately, they were out of burrata and prosciutto. The Carneval pizza had lots of good flavour and was made with San Marzano tomato, fresh mozza, salami, soppressata, Italian sausage, and basil. Good proportion of topping to crust so that each bite was just right. The crust had a light texture, crispy exterior and chewy interior. The only thing I didn’t like as much was that the pizza was quite droopy. 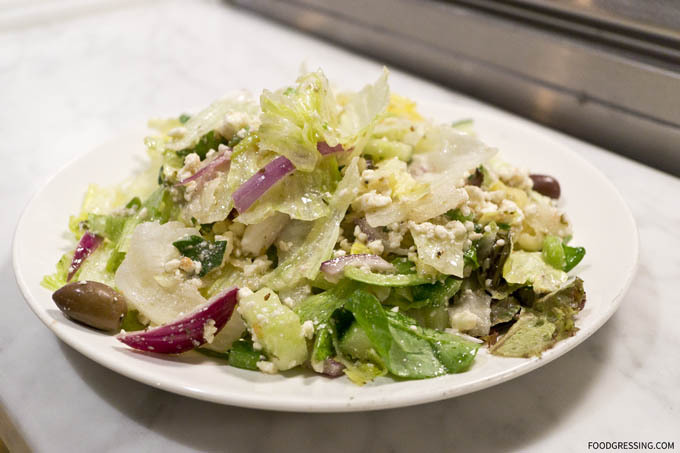 The Greek salad had the usual mixed greens, onions, cucumber, peppers, cherry tomatoe, and feta cheese. Certainly there was no cheaping out on ingredients; the portion given was impressive as it was served on a dinner plate. My issue with it was that it was very salty perhaps due to the large amount of feta. While it’s nice that they were generous with the feta, I think they need to tone it down a bit to make the flavours more balanced. Otherwise, pretty good value. Before leaving Kelowna for an overnight stay in Meritt, we visited the waterfront area one last time. I was in the mood for some Asian food so I decided to get some takeout from one popular Thai restaurant on Bernard Avenue, Bai Tong, before hitting the road. 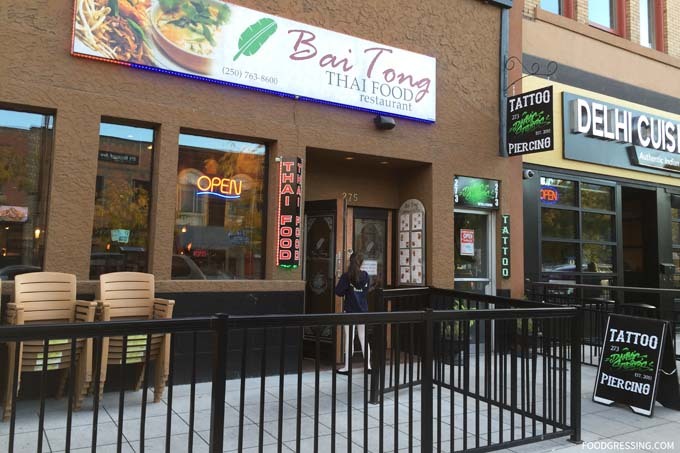 According to Trip Advisor, Bai Tong is one of the top 25 best restaurants in Kelowna and has a very high rating on both Trip Advisor and Zomato. Bai Tong is located in a prime spot near the waterfront and based on the reviews it seemed to be popular with tourists during the summer. Their outdoor patio was closed the day that I went as it was a rather windy evening, but the inside was very spacious and had a contemporary design. One thing I noticed was that there were actually quite a few customers seated inside the restaurant (a good sign) . They seemed to fare better than neighbouring restaurants which looked mostly empty. Bai Tong’s menu includes the usual Thai curries, rice dishes and noodles. 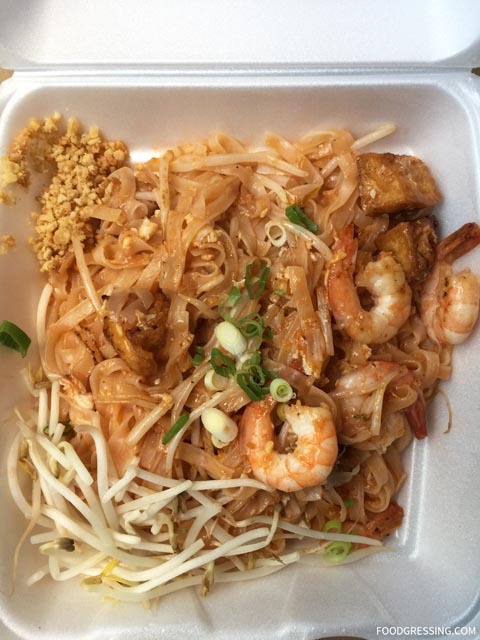 I ordered some simple dishes for takeout: chicken satays ($8.50), pad ma-moung him ma-pan ($12.50) and pad thai ($12.50). 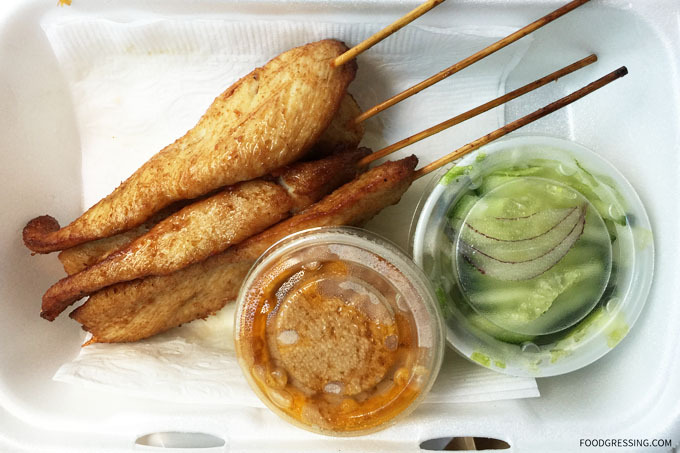 The chicken satays were better than expected – very flavourful, tasty. Served with a sweet peanut sauce and a cucumber salad. I would order this again. The pad thai had the usual stir-fried rice noodle, prawns, egg, tofu and green onion topped with bean sprouts and crushed peanuts. Lots of great flavour again – sweet, salty, sour, and spicy. 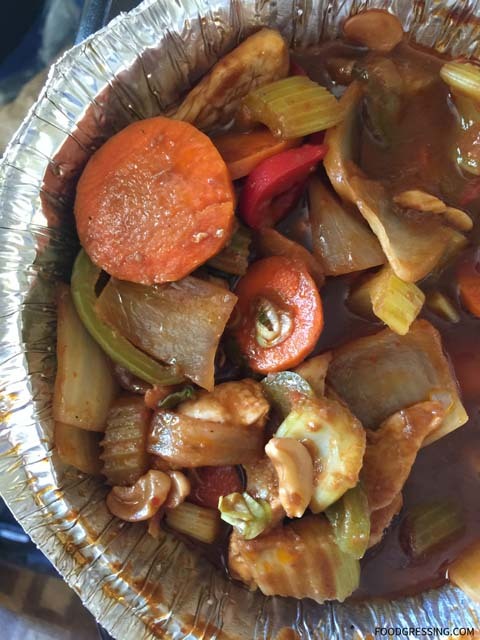 We also had the pad ma-moung him ma-pan which has stir-fried celery, bell peppers, white and green onions and cashew nuts in a house sauce. Very flavourful like the pad thai though less sweet and more on the savoury side. Before leaving Kelowna for an overnight stay in Merritt last week, I decided to visit Downtown Kelowna once last time to pick up some takeout. 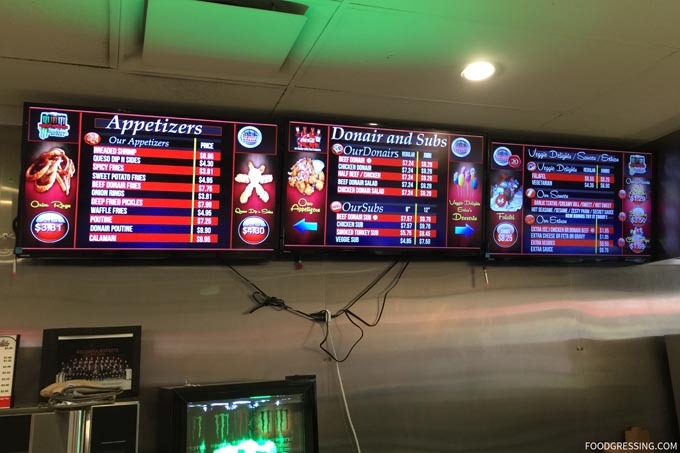 One of the places I visited was Subcity Donair, which I thought would have some reasonable eats that were fast to prepare and were reasonably satisfying. 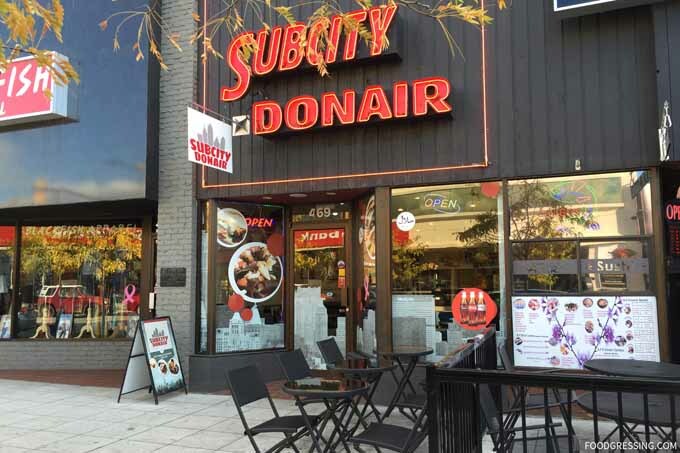 Subcity Donair is a BC franchise with 7 locations in the Okanagan – 5 in Kelowna. The one I visited was located at 469 Bernard Avenue. It seems like a potential place for late-night eats since they close at 3 am on Fridays and Saturdays. 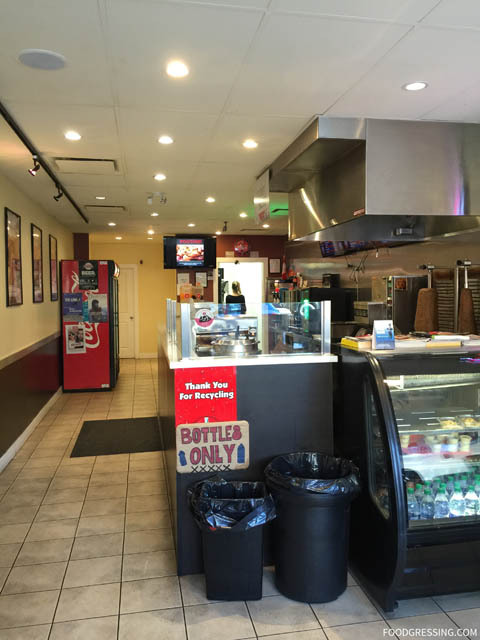 The interior is quite ordinary and serves its purpose as a quick and casual donair shop. On their website, they have a 360 degree view of the restaurant’s interior. On their menu are beef and chicken donairs, donair salads, subs and more. They also serve a few sides like breaded shrimp, spicy fries and onion rings. The one thing that I did notice was that they do not serve lamb, which is my go-to choice of meat for a donair. Their menu with pricing is available online. I was greeted by a friendly staff member as soon as I entered the door. I ordered, quite simply, a regular chicken donair ($7.24) with usual fixings, hummus and tzatziki sauce. 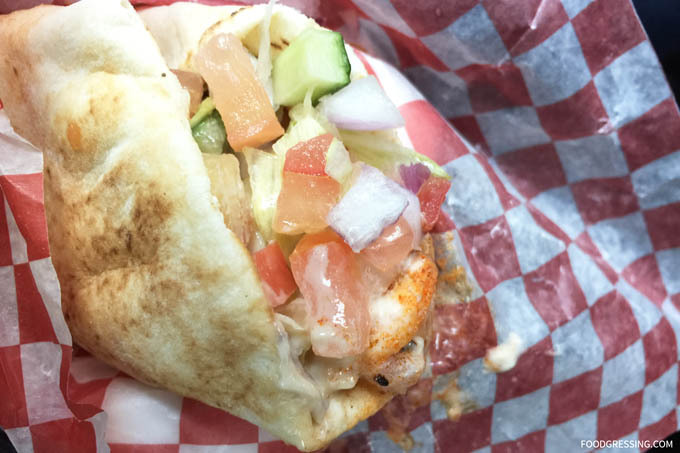 Overall, the donair tasted on point – good though nothing too memorable. I did feel like the donair was a bit small for the size perhaps because I had been accustomed to the large donairs from Donair Dude in Vancouver. On our recent trip to Kelowna, we explored the beautiful waterfront area which has gorgeous views of Lake Okanagan. It was a warm evening and I wanted to get a smoothie for my son. We soon stumbled upon a sign in front of a nearby Pita Pit promoting their smoothies. I honestly cannot remember the last time where I had anything from Pita Pit but I was curious as their smoothies fared against other places where we have had smoothies-on-the-go (ie, Jugo Juice, McDonald’s). 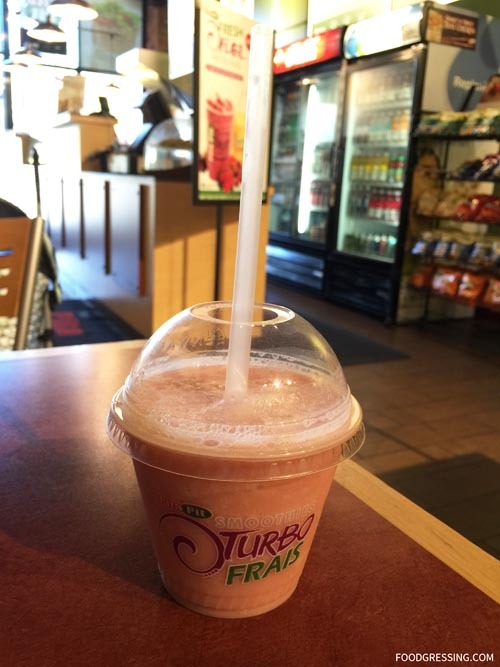 Pita Pit smoothies are made with 100% real fruit and real fruit juice, low-fat yogurt and no sugar added. They come in regular ($4.99) or snack sizes ($2.99). I quite liked that they offer snack sizes because if you have a picky eater (like my son) then the drink could potentially be wasted. 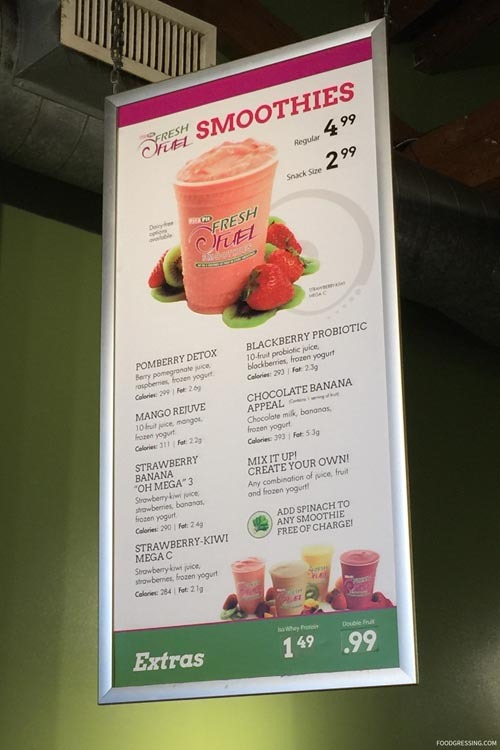 Based on how Pita Pita names their smoothies, it looks like they are marketing towards active, health-conscious individuals. Flavours include Pomberry Detox, Mango Rejuve, Strawberry Banana “Oh Mega” 3, Strawberry-Kiwi Mega C and more. You can create your own flavour with any combination of juice, fruit and frozen yogurt and add spinach to any smoothie for free. There is also an option to add whey protein. I chose the Strawberry Banana ‘Oh Mega’ 3 which is made with strawberry-kiwi juice, bananas, and low-fat frozen yogurt. The snack size has 167 calories, 38 grams of carbs, and 24 grams of sugar. The snack-sized smoothie came in a short, wider cup. The strawberry-kiwi juice flavours were distinguishable but the texture was just too thin for my liking. I like my smoothie thick enough to drink it up the straw but Pita Pit’s version was too watery. I would not order a smoothie from Pita Pit again. 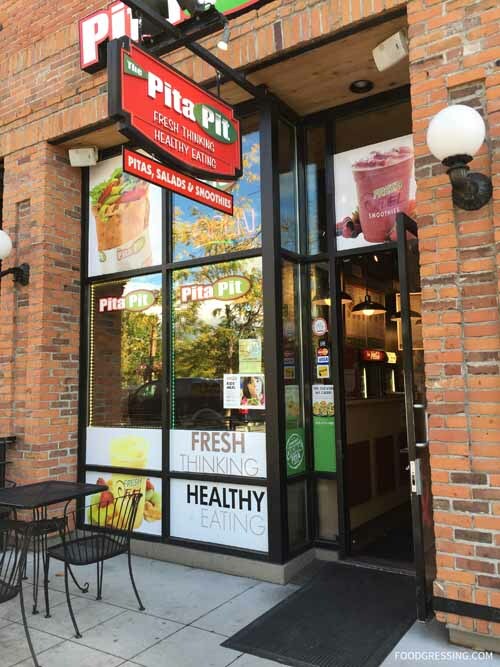 As for this Pita Pit location, staff seemed friendly enough and the restaurant appeared clean. I also want to give extra points to the staff because I forgot my credit card in their machine. They saved my credit card for me after I had left and I managed to retrieve it from them with no issues.